Tibia from a skeletally mature individual. 9 LAGs within the cortex, 4 LAGs within the EFS. LAG 1 is only partially obfuscated by medullary expansion. 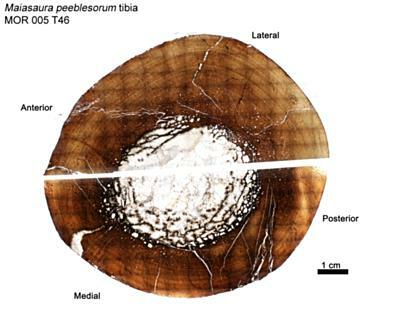 The transverse diaphyseal section was too large to make a single thin section slide from, so it was bisected, resulting in two thin section slides (white horizontal line is the kerf loss between the two halves).